It was one of the coolest things I ever saw on television, and I was just a wee lad of four years old. Oh, how I loved to watch the Batmobile in the Adam West-ravaged, 1960s TV series, "Batman," leave the Bat Cave. First, there was the firing of the ignition, which always included the stock shot of flames shooting from the Batmobile's exhaust. That was cool, too. But there was something about the black, souped-up 1955 Lincoln Futura zooming from the cave that captivated me. That's because there was this small guard rail that would flip down, enabling the Batmobile to pass through. THAT was the coolest thing. Some things just grab us and don't let go, particularly from our youth. There was something about that guard rail flipping down that I thought was just so awesome in its simple auspiciousness. I'm not sure which is more troubling---that Angus T. Jones has come out against his own show, "Two and a Half Men," as being "filth," or that it took the young man so many years to come to that conclusion. Jones, 19, who has been part of the one-joke show for its entire nine-year run, blasted "Men" in a video recorded in October but that has just recently popped up on YouTube. Appearing with a mostly shaved head and looking like either a hostage or a cult member, Jones says to the camera, "I'm on 'Two and a Half Men' and I don't want to be on it...Please stop watching it and filling your head with filth," Jones adds. "Do some research on the effects of television and your brain, and I promise you you'll have a decision to make when it comes to television and especially with what you watch on television." When I first started watching "Jeopardy," the dollar values were $10-50 for the first round and $20-100 for Double Jeopardy. The answers were revealed by stagehands pulling cards backstage. The only lights were the ones illuminating the stage. Don Pardo was the show announcer. Art Fleming was the host, and he didn't have all sorts of foreign words to over-pronounce. No one won trips or tens of thousands of dollars. The categories included such as "Potent Potables" and "Potpourri." But the game was still damned hard to play, and needed legitimate intellect in order to succeed. 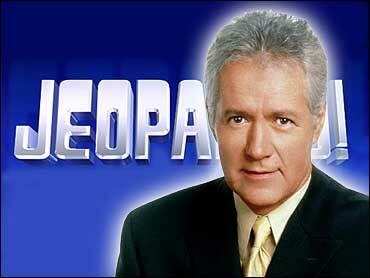 "Jeopardy" was never about spinning wheels or drawing cards or shouting "Big Money! Big Money!" or "No Whammies!" It was never about dumb luck or bouncing up and down on stage like a contestant on "Let's Make a Deal." The Sesame Street Muppets have become such a part of our social consciousness that I don't think any of us really stop to think that the Muppets aren't living, breathing creatures---we must remember that they're puppets, controlled and voiced by living, breathing humans. Humans, as in imperfect beings. The face of Elmo, one of the more popular Muppets, was ripped off in a shocking and vile manner recently, revealing that its puppeteer, Kevin Clash, has been allegedly involved, in the past, with some hanky panky with at least one underage youth. Two accusers came out against Clash, who is openly gay. The first recanted, saying that the relationship was consensual and legal (age-wise). But then a second accuser surfaced, and this one says that he and Clash became involved when the former was just 15 years old. So did you hear about the Cleveland woman who had to stand on a busy street corner and hold up a sign that says "Only an idiot would drive on the sidewalk to avoid a school bus"? To recap: 32-year-old Shena Hardin was caught by surveillance camera, driving her car on a sidewalk to avoid a school bus that was loading and unloading children. Her sentence, as handed down by a Municipal Court Judge, was to hold the sign for one hour each on Tuesday and Wednesday morning, in 34-degree weather and in full view of rush hour drivers. Hardin also had her license suspended for 30 days and she was ordered to pay $250 in court costs. Apparently, Hardin was the victim of a good old-fashioned sting, put on by the bus driver, because the incident in which she was caught by the camera was not the first time she had driven recklessly in order to avoid waiting for the kids to get on and off the school bus. Videotapes are so passe. And who has a VCR player anymore, anyway? E-mail (and its evil spawn, texting) is the smoking gun of the 21st century, when it comes to catching those engaging in extramarital affairs. And it seems no matter how powerful and how high up the food chain you are, you're not impervious to its tentacles. Witness what's happening at the CIA and the Pentagon these days. First, General David Petraeus (rhymes with Betray Us) was busted, and subsequently resigned his post as Director of the CIA, for engaging in hanky panky with a mistress, much of it via e-mail. Now the military's top man in Afghanistan, General John Allen, might be in the same kind of mess. E-mails, once again, are being scrutinized. It's a sort of love triangle, with Petraeus's mistress allegedly sending threatening e-mails to the woman who Allen has been allegedly fooling around with. OK, so you're Barack Obama. You woke up Wednesday morning having been re-elected as President of the United States. But over 57 million people voted for the other guy---almost half the electorate. It's a sobering thought, or should be, as Mr. Obama starts Term II. This was among the most bitter, divisive and nasty presidential campaigns in recent memory. Maybe ever. You can blame Social Media for that. But more about that in a second. Obama is president of everyone, of course (not just 47 percent), but knowing that about half the people don't want you in the Oval Office certainly should have a bearing on how you govern, no matter if you feel that your agenda and ideology are right, and theirs isn't. Fat Bob Taylor is still the best National Anthem singer I have ever heard. And he's been gone for 17 years now. I will tip my cap to the late Whitney Houston, whose stirring rendition at a Super Bowl is, without question, the best one-time effort on record. It beats out Marvin Gaye's version at the 1984 NBA All-Star Game, not long before he was tragically killed by his own father. But Fat Bob was the best anthem singer, pound-for-pound, and I'm not making weight jokes here. Taylor would show up at Tiger Stadium, but not every night. Just on the big nights, like the old Shrine Night or Polish-American Night. Or playoff games. Or whenever there was likely to be a big crowd and the Tigers invited Fat Bob to Michigan and Trumbull. Taylor would stand in front of home plate, with stiff posture, a mike stand before him. His arms at his sides, the bearded man with the jet black hair would then boom out the National Anthem and you'd get chills.